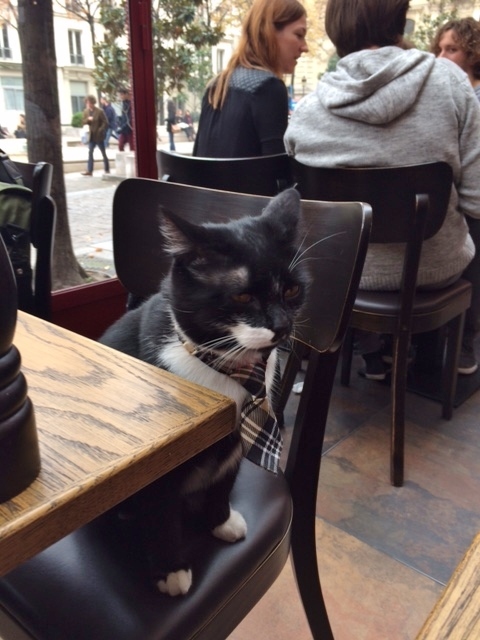 This entry was posted in cats, paris, photography and tagged brasserie, cats, France, Paris, photography, Sorbonne. Bookmark the permalink. Hi Debbie. The first day is just titled Living a Dream. I should adjust it perhaps. It has been a lifetime wish to do that and I got so much more out of it than I expected. Thank you for reading. I actually have been wanting to read the whole blog but couldn’t find the first page to start. Will have another look. And a very sophisticated customer, too. Parisians certainly love their animals – I once sat at a brasserie in Paris with someone’s dalmatian resting his nose on the corner of my table. He watched every bite that went into my mouth. Oh no, Di! The nose on the table would have been off-putting! Our gentleman had perfect manners. ‘You Beaut’ – I woke up this morning to find my trip was not yet over and I am now in Paris. I love your neighboring customer and his little tartan tie. What a change from a medieval village and its little delightful patisserie and mysterious doors and windows. You are both obviously having a wonderful time still. Thanks for sharing. What a lovely response, Marg! We are enjoying ourselves in this new environment, and oh, yes, so far removed from life in Menerbes. I love his tie, too. Yes that’s the fun part of being in Paris. You’re right, Tony. These surprises are all part of the fun. How wonderful! I whish we were more liberal with our rules here, The cat looks better behaved than some children that I have had the misfortune to be seated nearby. What did it have for dinner? He was beautifully behaved, Sue. He was not impressed that the waiters were slow with the menu so he left. Paris is my favorite city in the world! I would love to live there someday. This is just one of many reasons I love it. The French know how to do life right. Sitting in a cafe on any given day in Paris my paradise. I can’t wait to go back. I hope you enjoy it as much as we do. Bonne journee Karen! You are so right, Phillip. Paris is one of my favourite cities, too. Just walking the streets and sitting in cafes is one of the best things to do here. Thanks so much for your comment. Just curious, what is your favorite neighborhood? Mine is St-Germain-des-Pres. That’s a great neighbourhood. Definitely prefer the left bank, too. We stay up the hill behind Pantheon. I expect he was waiting for his “Kitty Cat” to be served…. Ha ha. And she would have been as elegant as he was, I’m sure!